SAE Towers’ predecessor companies have been manufacturing transmission towers and building transmission lines since 1926, when it all started with the original SAE in Lecco, Italy. From the late ’50s through the mid-’90s, SAE of Italy, followed by SBE of Brazil, supplied in excess of one million tons of tower steel to U.S. and Canadian utility companies. These companies have made an indelible mark on the industry, through the years having supplied towers that carried over 320,000 circuit miles of transmission lines, more than enough to circle the globe twelve times over. 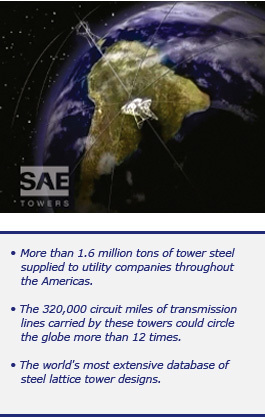 Today’s SAE Towers was spun off from ABB, Ltd.’s steel lattice tower manufacturing divisions that had operations and personnel in the United States, Mexico and Brazil. In 2010, SAE Towers became part of KEC International Limited, a highly respected public company with more than 60 years of experience in turnkey construction of power lines and a track record of having successfully executed transmission tower projects in 50 countries. KEC is a listed company on major Indian stock exchanges and has annual revenues of approximately $1.3 billion (US).